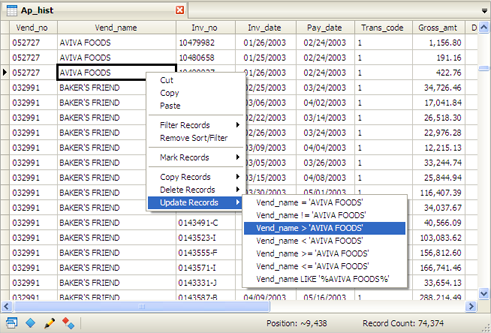 Strata also provides you with the ability to update/replace individual cells in a table. This is often useful when you need make a global change to your dataset. You can replace a subset of records from a table based on criteria in a given cell. 1. Right-click on the cell that contains the criteria you want to use as the basis for replacing records, then move the mouse over "Update Values". 2. Select one of the options from the "Update Values" sub-menu, such as replacing records equal to the value, greater than the value, etc. This action will automatically populate the the Update dialog as discussed below. • Field Name: This is a drop-down menu where you specify the field you want to update with new values. • Replacement Value: This is the new value that will replace the old value. • Boolean Formula: This is the required Boolean condition needed for the update to occur. In the example above, when a field called "Vendor Name" is equal to "AVIVA FOODS", we will replace the cell in the field called "Discount" with a new value, "0.05". NOTE: To pre-populate your dialog, simply highlight the field(s) you wish to use before selecting the Sort option. In the previous example, the Replacement Value was a specific number. However, there are occasions where you may want to perform a more advanced replace operation. 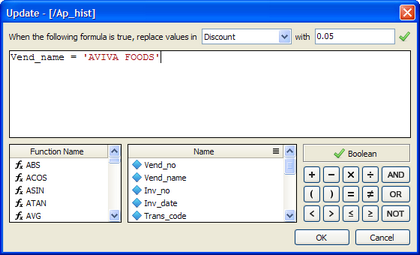 In this case, instead of a specific value, you can use formulas. In this data set, this specific replace operation would replace all the cells in a consistent "PO Box" format. It is advised to first try using a calculated field to test your logic prior to actually running your replacement operation. NOTE 1: A Field Name is the only item required to run an update operation. This means that if you leave the Replacement Value empty, each matching value will effectively be deleted (replaced with no value). 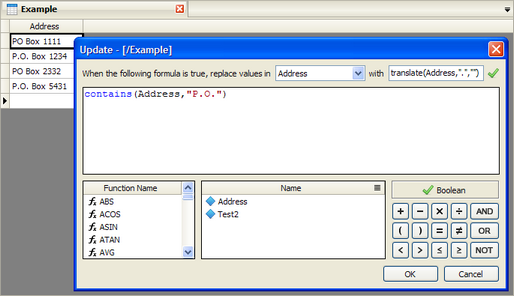 If there is no formula entered, this means that you want to run the replace operation on the entire field. If you choose either of these operations, please proceed with caution. NOTE 2: In order to append data to a table, you must first go to the Edit menu and make sure that "Protect Data" is turned off (unchecked).